At the Sprat & Winkle Quilters Group we have been asked to make small quilts for the Special Baby Care Unit at Winchester Hospital. This is something that we do usually every other year. 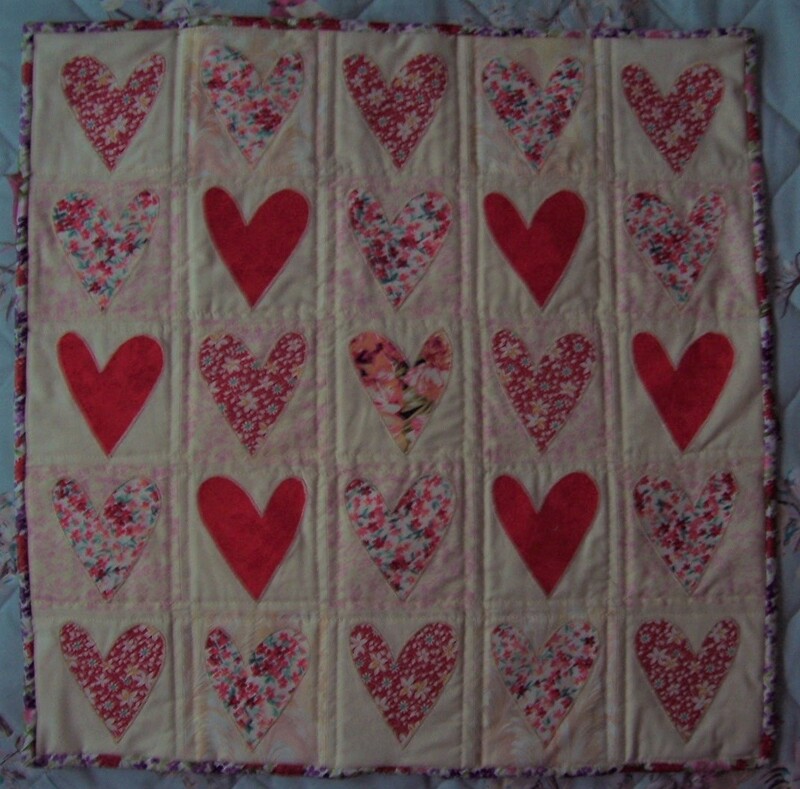 The maximum size of the quilt should be 24 inches square and this year the theme is Hearts. 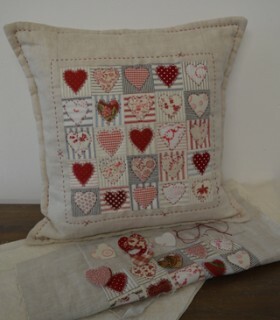 I remember a design used by Jo at Cowslip Workshops in Cornwall that featured squares with appliqué hearts and decided to base my quilt on that idea. I checked my (giant!) box of scraps and selected several pieces in the Red colourway. These were pressed and the final selection was 3 different pieces to which I applied HeatnBond fusible web. 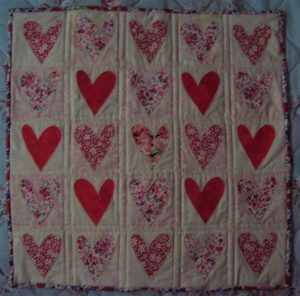 I have a great ‘folk art’ style heart-shaped die for my Sissix machine and used that to cut 25 shapes from the prepared fabrics. Using mostly plain calico (from Lady Sew & Sew) I cut some 5 inch squares to which I then applied the heart shapes. Then I arranged the squares/hearts in a symmetrical design before using a fine satin stitch around the edge of each heart shape. The squares were sewn together using a 3/8th seam allowance and turnings were pressed open and flat. The quilt sandwich is made from some cotton/polyester wadding from my scrap plus more plain Calico for the backing. The quilting was done on the machine using a 3.5 stitch length, a quilting needle and walking foot. The design is a grid straight lines 3/8th from each joining seam. The binding was cut from one of the other remnants in my scrap bin. I cut on the straight grain 2½ inches wide with diagonal seams. The binding was pressed in half wrong sides together before applying to the right side of the quilt. I mitred the corners and turned to the reverse of the quilt before hand stitching in place. The finished quilt measures just 21 inches square. I am so pleased with the quilt that I intend to make another! Next time using remnants of Blue print cottons and possibly striped fabrics for the background squares as demonstrated in the Cowslip Workshops cushion. Another day in the sewing room and I now have the final finished version of a Modesty panel Camisole top in White Crepe de Chine complete with lace trimmed panel. Having made the required alterations to the toile and transferred the changes to the pattern I then copied out a new pattern. I found some White polyester Crepe de Chine in my stash which was just right for this project. I also had some short lengths of pretty White scalloped-edge lace for trimming the modesty panel. The bust darts were stitched on the sewing machine. I used the 3-thread overlocker for the first pass on French seams for the shoulder and side seams which were then stitched again on the sewing machine. I overlocked the raw edge of the scoop neckline before turning to the inside and stitching in place. The armholes were bound with narrow self-bias binding. The hem has a rolled hem sewn with the overlocker. The front panel was cut on the fold so that it is self-lined and the lace was applied with a narrow zig-zag stitch. Lots of different techniques and finishes on this ‘simple’ top. Once the main camisole had been completed I had a fitting and pinned the modesty panel in place. I needed to raise it about ½ inch but apart from that everything was fine. 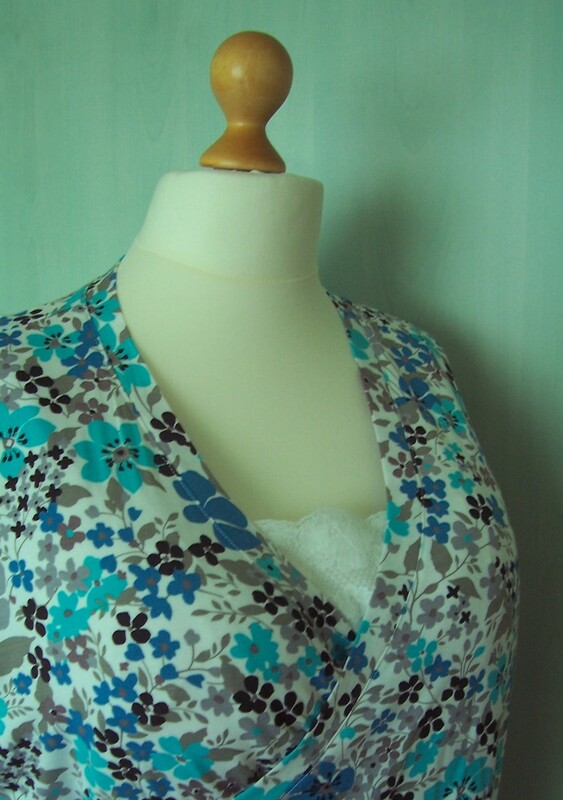 I am very pleased with my make and it looks lovely just peeping out at the base of the V-neckline of the wrap tops. 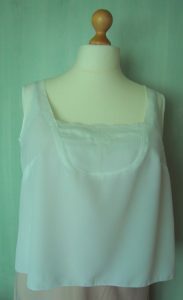 However, it has taken two sessions of sewing, although the materials all came from my stash and are therefore ‘free’ it does not really compare economically when you can buy a ready-made top for £7.99 from eBay! The 3 Dartmouth wrap front tops are very much flavour of the month at present but just one slight problem. When moving about the wrap tends to slip down to display a large amount of décolletage. 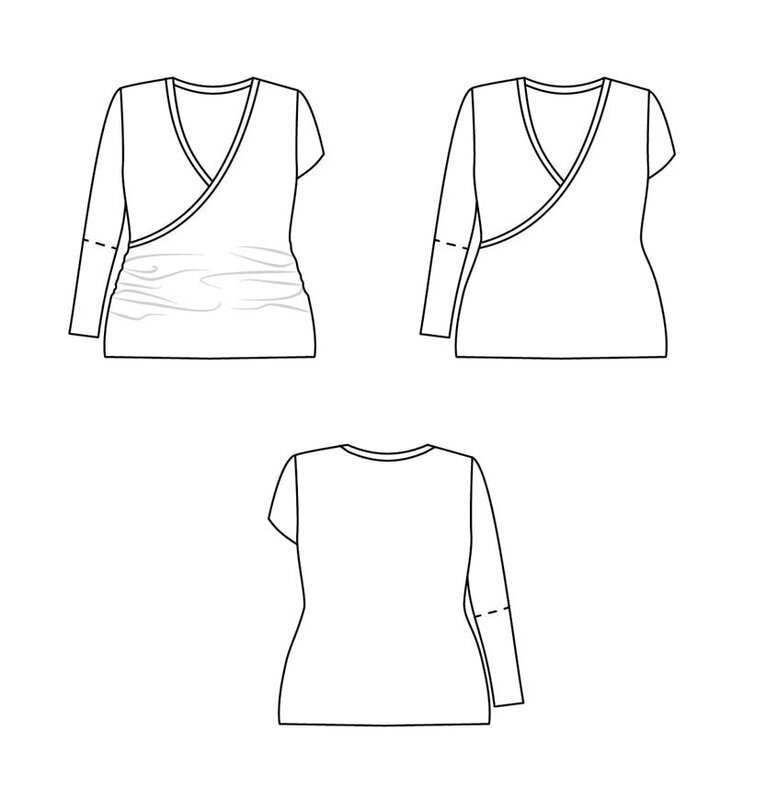 I have ordered a lace trimmed camisole top in Cream from eBay, but whilst waiting for it to arrive thought I would ‘have a go’ at designing and making a camisole-style top that I could wear with interchangeable panels to match or co-ordinate with whichever top (or later wrap dress) that I am wearing. 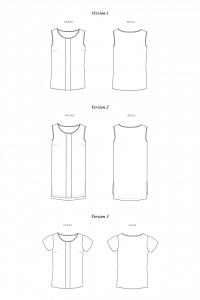 Starting point was the Sorbetto top which is a free download pdf from Colette Patterns. I checked my measurements and traced off view 1 size 18. Then I started to hack! 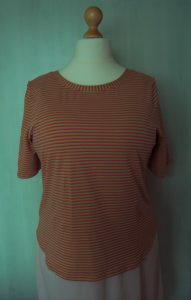 I deleted the front pleat, reduced the length by 2¾ inches, reduced the width of the shoulders to 3 inches and then re-shaped the neckline. I made a very deep scoop at the front which is where the interchangeable ‘modesty’ panel will be fitted and then drafted a separate pattern piece for the panel. I was anxious to try out my pattern. To make the toile I cut the front and back bodice pieces from Winter White lining fabric and the modesty panel from some White embroidered cotton remnant. Raised the shoulders by ½ inch which then placed the bust darts correctly pointing to my apex. Took in at the side seams, ¾ inch at the underarm grading out from the waistline to the hem by ½ inch. This effectively makes the top a size 16 at the shoulders and bust grading to an 18 at the hips. Reduced the height of the inset panel by 2 inches. 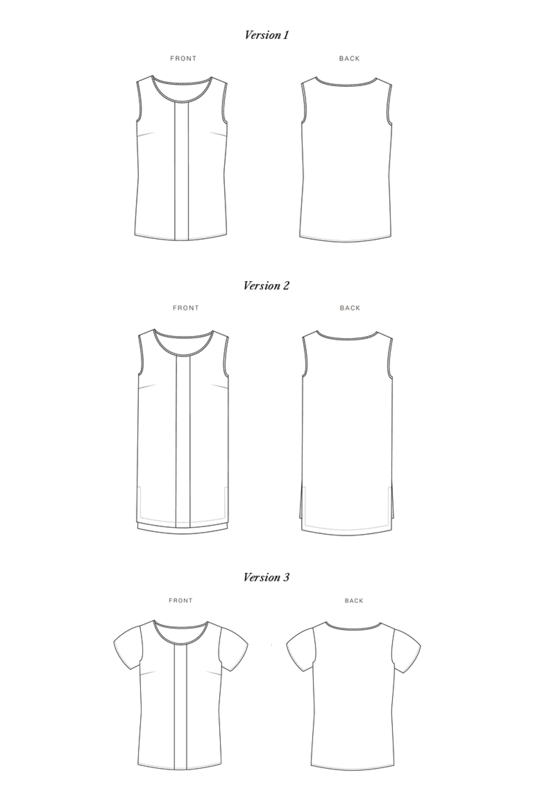 My idea for an interchangeable panel does not quite work but by keeping the top very simple I think that I will be able to make several versions with co-ordinating panels to wear with my Dartmouth wrap tops. Next step is to make the first ‘proper’ camisole in some White polyester crepe de chine with a White lace-trimmed modesty panel. Photos to follow. 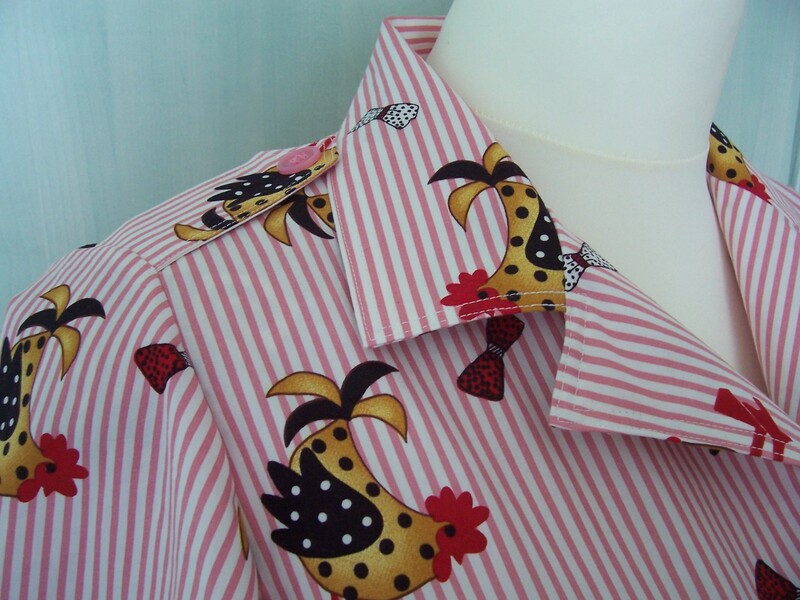 Chickens on Pink Stripes Blouse – But Where is the Love? 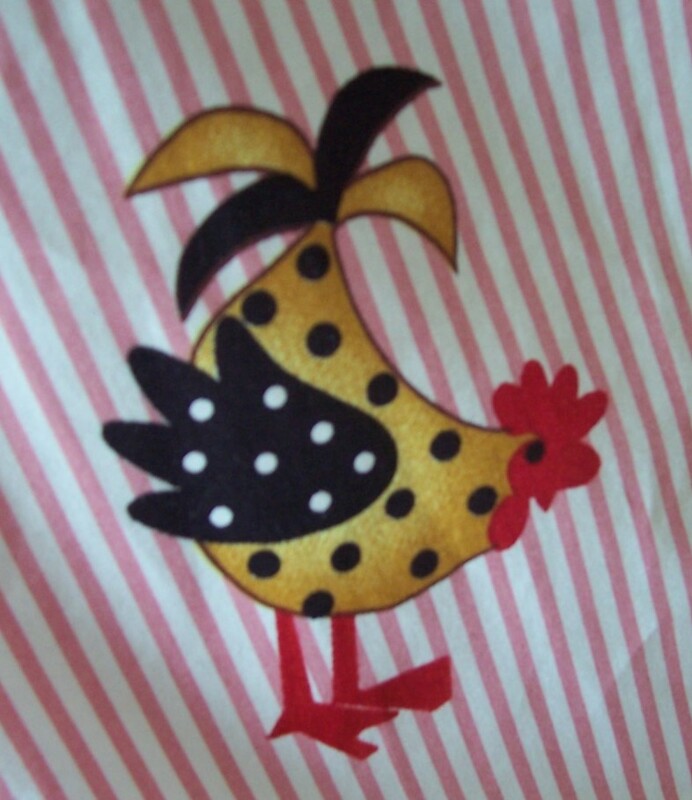 I am a shoe-in for a novelty print and fell in love with this crisp 100% cotton from Fabricland at £3.99/metre. 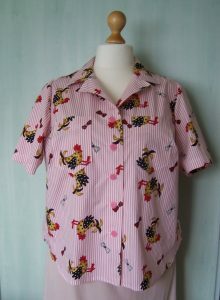 It called to me to be made into a blouse with shirt-tail hem. 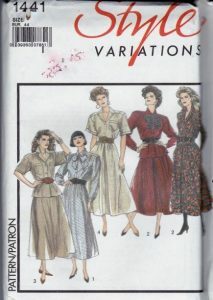 Many years ago I hacked the blouse pattern from Style 1441 to remove the yoke and bodice gathers. I converted to a straight shoulder seam, added bust darts and a shirt tail hemline. Since then I have made up the new pattern several times and always enjoyed the end results. But not so this time. 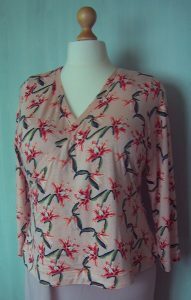 The blouse is lovely and though I say it myself, beautifully made, but I am not in love with it. I don’t understand it and cannot put my finger on the why I don’t love it. Perhaps I have been spoilt recently with all the easy jersey knit makes. 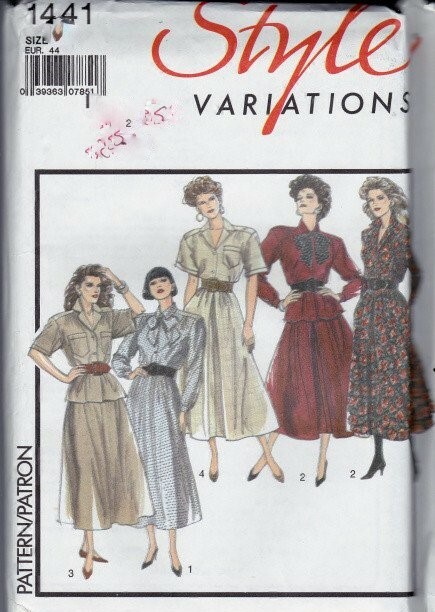 To return to the precision needed when sewing woven fabrics has been time-consuming and at times, traumatic as I tried to get the collar and revere of the blouse to sit just right, not to mention easing in the sleeves. Having made the collar and a pair of epaulettes at the beginning of the sewing session I was enthusiastic and stitched a double row of top stitching which then had to be repeated on the sleeve hems, pocket tops and down the front of the bodice. A very time-consuming accent. 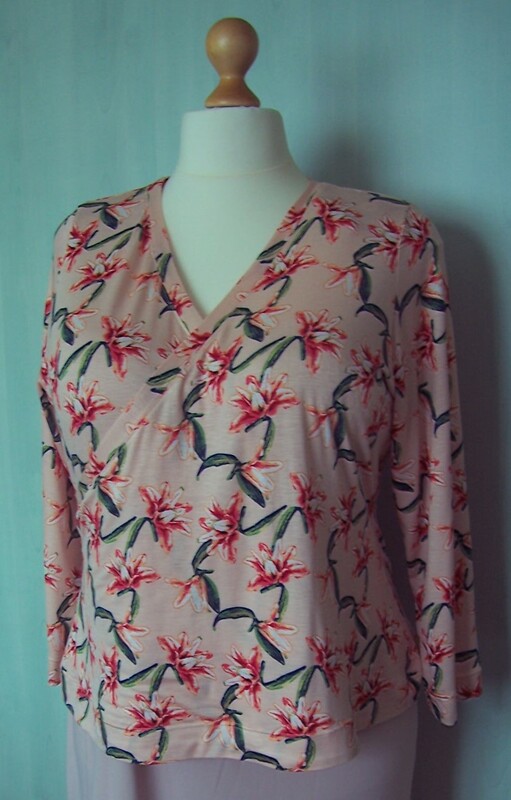 I have continued with the project which has taken at least 3 sessions of sewing and about 6 hours to complete which if one was to calculate costs based on the minimum wage of £7.50/hour, fabric, thread and buttons – this blouse has now cost in the region of £57.00! I may come to love the blouse but if not then I shall offer for sale on eBay – but at a fraction of the true cost. 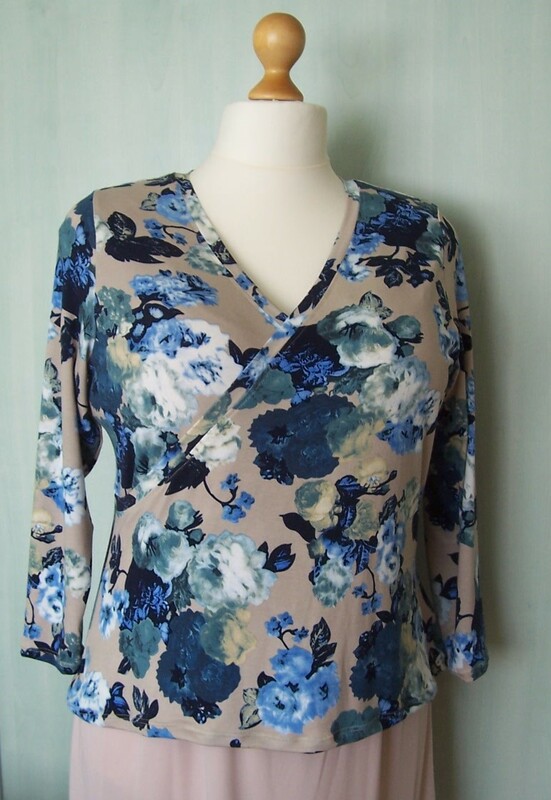 From Rosenberg & Son at the Sewing for Pleasure Show last month, I purchased 1½ metres of this beautiful large blue floral on a Beige background printed jersey fabric for a total of £6.00. I have no idea of the fibre composition but is probably a polyester/viscose blend. It is stretchy and very soft to the touch. As I had sufficient fabric, this time I opted for the full length sleeves. I had reduced the width of the long sleeves and again the bodice was 2 inches shorter than the original pattern. As the fabric was so stretchy I opted to take 5/8th seam allowance and this has produced a slightly closer fit – but all good. This top has become my ‘go to’ knit top for Summer as it has such a nice neckline and being made in a jersey fabric means that it is so very comfortable to wear. I love the Raspberry and Lime cotton jersey from New Threads Quilt Shop. I was wearing the tee top in this fabric when I returned to the shop and purchased the final length from the roll that they had in store – 2.25 metres on ‘sale’ at £5.00 per metre. On returning home the fabric was immediately washed and by the end of the afternoon had been dried and pressed ready for cutting out. I was going to ‘hack’ the Paola polo neck top into a dress Monetta-style. I traced off the bodice and sleeve of the Paola. Traced the waistline and then added 5/8 th inch seam allowance. I also made a sway back adjustment to the back bodice. There would not be sufficient fabric for a long sleeve, the pattern was cut with a 6 inch underarm seam. The skirt was cut from the Monetta pattern with the back skirt cut at the selvedge so would have to have a seam. Stitching was straightforward and I am particularly pleased with the shaping of the scoop neckline which was done entirely freehand. I gathered the skirt using ½ inch wide clear elastic and a triple zig-zag stitch to secure the elastic to the top edge of the skirt panels. The sleeves are a little longer than I really wanted and so they have a 1½ inch turning which was then top stitched with the twin needle. Thereby is a happy accident. I had not changed the stitch setting when I threaded up the twin needle. Thus the hem stitching on the sleeves is decorative with two rows of the triple zig zag stitch. I repeated this stitch when turning up the hem of the skirt and I think it makes a very nice feature. I have one more Dartmouth wrap front top cut out and once that is stitched I plan to revert to 100% woven cotton fabrics for a while – at present I am jersey knit fabric’d out! From Montreux at a cost of £12.00 just 1 metre of fabric was needed to make this short sleeved version of my new favourite pattern. The fabric content was labelled as micromodal elastane. This is a new type of fabric for me but in any event, it does not feel at all synthetic and is lovely and soft. Apart from making the shorter sleeved version the only other adjustment was to reduce the length of the bodice by 2 inches. The top goes together really quickly and again the fit is very good. So that’s Dartmouth no 2 finished and ready to wear. By way of a change I have now laundered some longer lengths of jersey fabric so next up will be a dress. Please keep an eye open for the post. 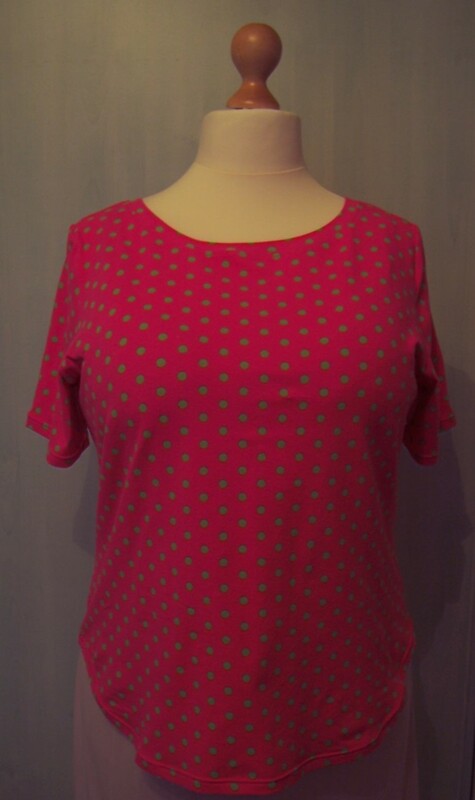 As promised, I have put the Paolina tee top to one side for a while whilst I try out a new pattern. In over 50 years of sewing I have never made a wrap front top or dress. There seems to be many versions on Pinterest, the various vlogs and blogs that I follow so I have taken the leap and purchased the Dartmouth pattern from Cashmerette. Dreaming of a pattern that is casual and chic? Look no further than the Dartmouth Top! 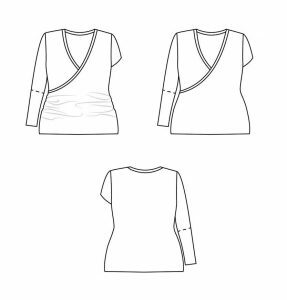 This cross-over jersey top comes with two variations—a classic fixed wrap or modern ruched front—and features three sleeve lengths and a gape-free banded neckline. Whether made in a cosy sweater knit or slinky silk jersey, the Dartmouth is the perfect partner for your favourite pair of jeans! 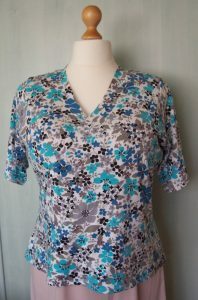 RECOMMENDED FABRIC: Mid-weight knit fabric, such as cotton or rayon jersey, with at least 50% stretch. Also suitable for light to mid-weight sweater knits. As this is to be a wearable toile, I used a length of fine silky tee-shirt weight viscose jersey purchased some time ago from Fabricland in Salisbury. The fabric has been laundered and was originally intended for a Moneta dress but as the fabric has great drape I thought I would use it for the Dartmouth instead. I checked the measurement chart and cut a size 20 C cup for view B which does not have the additional ruching at the side seams. I reduced the length of the bodice by just 1 inch and kept the sleeves the same long length. 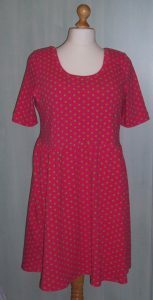 I had plenty of fabric and it is easy to shorten sleeves if they are too long. Cutting out according to my own pattern layout took just 1.40 metres of 150 cm wide fabric. Construction was straightforward as I followed the comprehensive instructions. There were just a few changes that I made. I do not use clear elastic in the shoulder seams – I prefer a narrow strip of fusible interfacing. For all the seams, excluding the hems, I used my 4-thread overlocker. This first make took a little over 1 hour but I believe that with a more stable fabric (this one slip and slid all over the place!) I should be able to stitch a Dartmouth in just 1 hour. First fit was very good in all areas except length. I turned up the sleeves and the bodice hems by 1 ½ inches before securing with twin-needle stitching. Also with a more stable knit I will probably narrow the sleeves a little from the elbow to the cuff. 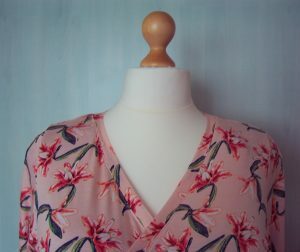 I especially like the banding on the neckline and front wraps of this top and will certainly make the pattern again. Dartmouth gets a thumbs up from me! OK, by now you will all be Paolina’d-out and I promise this is the last for a while. This is the companion fabric to the Paolina no 5 but instead of polka dots, this version has narrow (1/8 inch) stripes in those fruity colours of Raspberry and Lime. The 1 metre length of fabric was purchased on ‘Sale’ from New Threads Quilt shop so is yet another £5.00 top. Same old, same old. Nothing new in terms of construction. I am really much more confident with the neck banding now but you will notice I still have the stripes vertical to avoid any drift when attaching the band! I have just purchased the Dartmouth wrap front top pattern from Cashmerette so that will be appearing next on the blog. Hooray I hear you shout – something different at last! At a stretch you could say that most of my recent makes have been on a fruity theme. There was the Paolina no 2 which was a Yellow – not quite Banana – more Peach, no 3 was Lime and now no 5 is in Raspberry and Lime. The fabric is a Cotton jersey purchased from the sale lines at New Threads Quilt Shop. Just £5 per metre and one metre is sufficient to make the top complete with shaped hem. It is long enough to tuck into skirts or leave over the top of jeans and cut offs. Having learned my lesson with the Ditsy Blue Floral print cotton jersey, this fabric was pre-washed which unfortunately means that it is not now quite as soft as it was when originally purchased, but is still comfortable to wear. 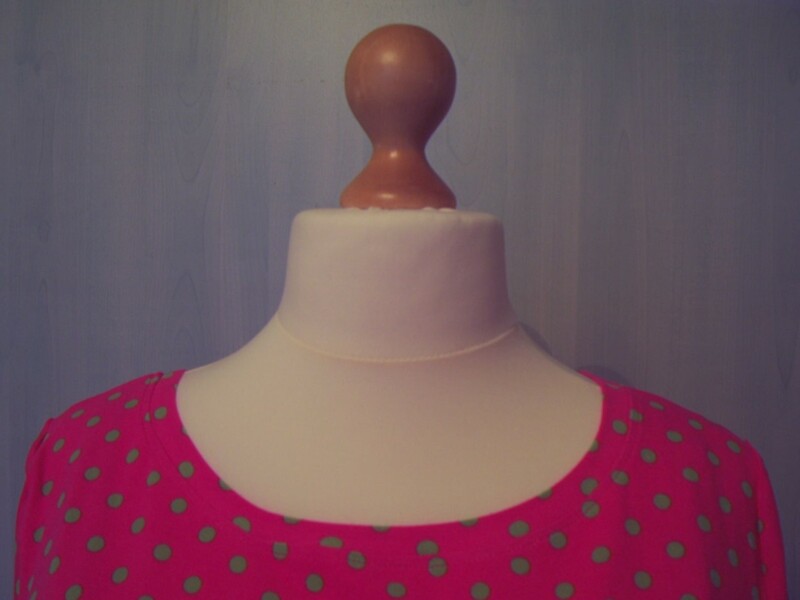 Again I pressed the neck band prior to pinning and stitching to the neckline. I also pressed the shaped hem prior to stitching with the twin needle. 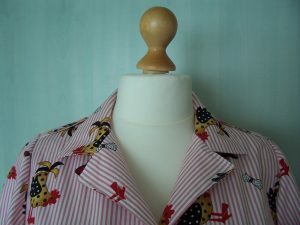 As you will know from this blog, I am no shrinking violet when it comes to colours and prints. This fabric also comes in Raspberry and Lime narrow stripes. I have bought another metre of that design and whilst the overlocker is threaded up with matching thread, will ‘run up’ Paolina no 6. I am delighted with the Polka dot top and I think it will look great worn with White jeans or capris when the warm, sunny weather returns.